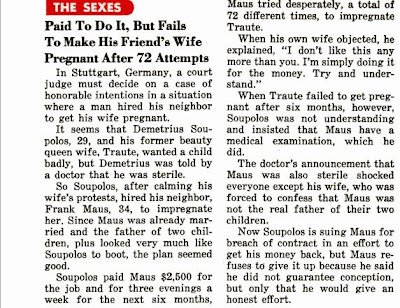 Hehe, I like that he gave an "honest effort"
What other kind of effort could you give in the situation? "We are all in the gutter but some of us are looking at the stars"
"I am only doing it for the money"
Some people have all the luck. Until they find out their kids aren't theirs. This sounds like the plot to a comedy movie that might actually be funny.